Celebrate women, art and education in our community at the 14th annual Women’s Luncheon on Monday, November 12, 2018. In conjunction with our 2018 banner exhibit, DRIVE! 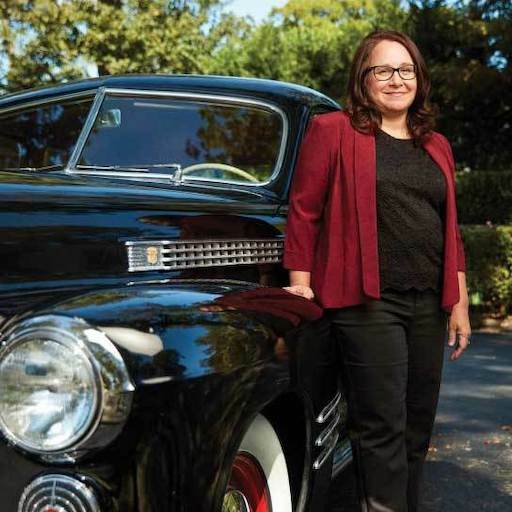 Iconic American Cars and Motorcycles, this year’s speaker will be Katherine J. Parkin, Professor of History at Monmouth University and author of Women at the Wheel: A Century of Buying, Driving and Fixing Cars. Parkin will address key themes in her book that illuminates the social impolications of how we-in American culture-have positioned the experience of buying, driving and fixing cars (for men vs. women) in advertising, pop-culture, and literature-really how this messaging has influenced social norms in our society. Published in August 2017, the book has received national acclaim and is winner of the Emily Toth Award for best book in feminist pop culture, 2018. Find out more about the event and the Taubman Museum. “Join us for a talk presented by Dr. Katherine Parkin, Professor of History at Monmouth University in New Jersey. She has written extensively on US Women’s, Social, and Cultural History. Her first book, Food is Love: Food Advertising and Gender Roles in Modern America, was awarded the Emily Toth Award for best book in feminist popular culture in 2006. Her newest book, Women at the Wheel: A Century of Buying, Driving, and Fixing Cars, was published October of 2017, and also won the Emily Toth award. Learn more about this interesting lecture by reading this lengthy excerpt from her book as it was published on the Hemmings Blog.